I’ve been eyeing this ice cream stall at SM Megamall for a long time now. 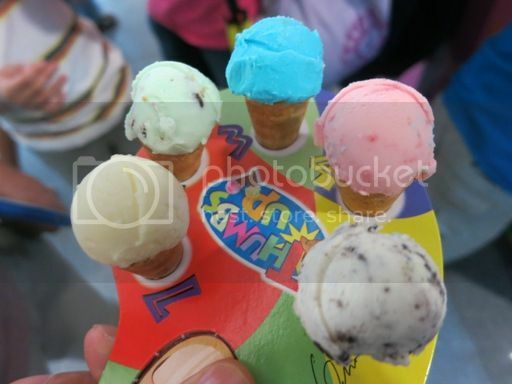 I was intrigued by those small ice cream cones on a palette that kids are going gaga over. We finally had the chance to try them two Saturdays ago when our little boy requested for some playtime at Timezone. We bought 5 palettes of Thumbs Up Ice Cream for only Php145.00; each palette costs Php29.00. The palette functions as an ice cream cone holder, a multi-cone holder to be exact. Each palette holds five small ice cream cones. You can have five different ice cream flavors in one order or just choose your all-time favorite ice cream flavor. They have White Chocolate, Cheesecake, Chocolate, Ube, Mocha, Cookies & Cream, Vanilla Cookie Dough, Double Dutch, Cheese, Avocado, Bubble Gum, Chocolate Mint, Coffee Fudge, Rainbow Sprinkles and Strawberry. 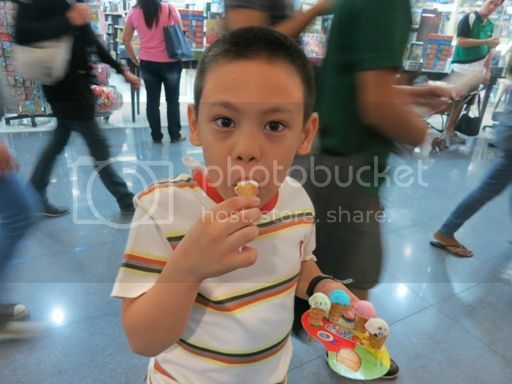 What I liked about Thumbs Up Ice Cream is that I could control the sweets intake of my son. Having five different ice cream flavors at one time gave him the feeling that he’s eaten a lot so he won’t have to ask for another one. The adults (that’s us!) enjoyed their ice cream, too. In particular, I liked the Chocolate Mint flavor. This entry was posted in SM Megamall, Thumbs Up Ice Cream. Bookmark the permalink. My daughter is a huge fan of thumbs up ice cream. Whenever we pass that by in the mall, she just has to have her fix. I often see this at malls. The small cones are so cute! Ykaie and my nieces loves Thumbs Up because they can hold the cones with their little fingers!